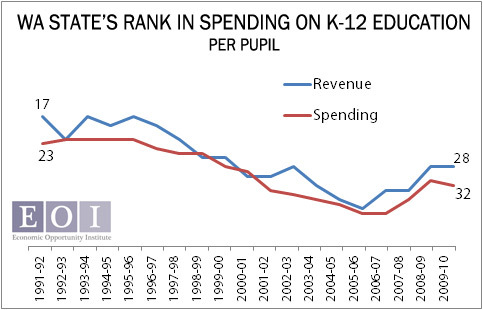 Washington has fallen behind other states in our commitment to funding our K-12 public education system. Data just released by the U.S. Census Bureau show Washington slipped to 46th place among the 50 states plus the District of Columbia in public school spending in the 2009-10 school year, one spot lower than last year. When measured against total personal income in the state, only the District of Columbia, Tennessee and Florida (both of which lack a broad-based personal income tax) and Arizona spent less on public education than Washington. On a per pupil basis, Washington came in 28th. 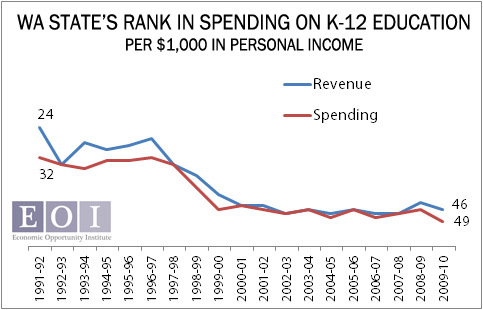 In 1991, Washington ranked 32nd in spending relative to state personal income and 23rd in per pupil spending. Earlier this year, Washington’s Supreme Court ruled the state legislature was failing to provide adequate funding for K-12 education, in direct violation of our state constitution.